News of Don Ritchie’s death was announced at the weekend. Andy Milroy has expanded the Foreword he wrote for Don Ritchie’s biography to give a more rounded picture of his truly remarkable career and we reproduce it below with permission as a fitting tribute to an amazing career and man. “Don Ritchie is justifiably regarded by many as one of the greatest ultra runners of modern times. With track World Best Performances at 50 km (twice), 40 miles, 50 miles (twice), 100 km, 150 km, 100 miles and 200 km, plus world road bests at 100 km and 100 miles he had an unparalleled record in the sub 24 hour events. Added to this is his excellent competitive record both at home and abroad. He had numerous Continental 100 km wins to his credit, (including setting a world road best) , and a 100 mile world road best in the USA. In 1990 he produced the best 24 Hour performance of the year, some fourteen years after setting his first world track best. This distance was to win him the inaugural IAU 24 Hour Championships in Milton Keynes. In 1989 he had attempted the record for the John O’Groats-Lands End run -846.4 miles from one end of the United Kingdom to the other. Despite serious physical problems, Don set a new record of 10 days 15 hours and 27 minutes for the distance. A tribute to his steely determination. It is rare for a top class runner to have a long career. The sustained stress of pushing one’s body to the limit usually results eventually in career-ending injury. Don Ritchie did have significant injuries, but he came back from these to add further laurels to his already distinguished list of achievements. As late as 2001 he was a member of the British 24 Hour team that won the Bronze team medal at Uden in the Netherlands. This was 24 years after Don’s first World Best at 50 km in 1977! Don’s longevity as a runner allied to his ability to push himself to the limit, to sustain a pace, only very slowly giving way in inexorable fatigue, made him virtually unique among Ultrarunners. His willingness to share his hard won knowledge and experience with others was also notable. As a coach of Simon Pride, subsequent winner of the World 100 km Challenge, and also as contributor to first, Training for Ultras and then Training for Ultrarunning books, Don provided detailed information on his preparation for his major ultra feats. 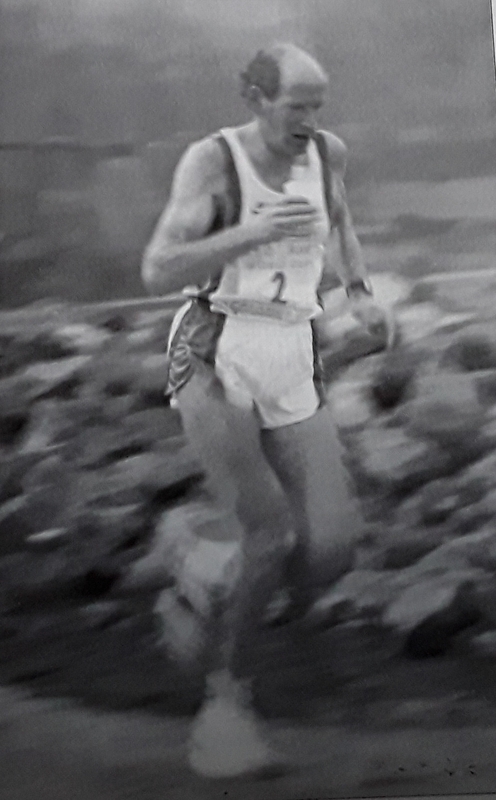 His autobiography “THE STUBBORN SCOTSMAN DON RITCHIE world Record Holding Ultra Distance Runner” published late in 2016 revealed his running career in typical unfussy detail. His remarkable masterpiece of 6:10:20 for 100 km is covered in just three quarters of a page but is placed in context. His meticulous training diaries are recorded for many of those major runs. Don’s legacy is not just the inspiration of his remarkable records but also his determination to pass on his knowledge and experience for those who come after him.